Thanks be to Janet for putting together the Soul Doll group order, I got two pairs of acrylic eyes, pale green & pale pink. They are different than the macreative eyes. The white are a matte plastic. I think they look very pretty, if not as deep and luminous as the fine glass eyes. And also thanks be to Mia for organizing the last Customhouse group order! 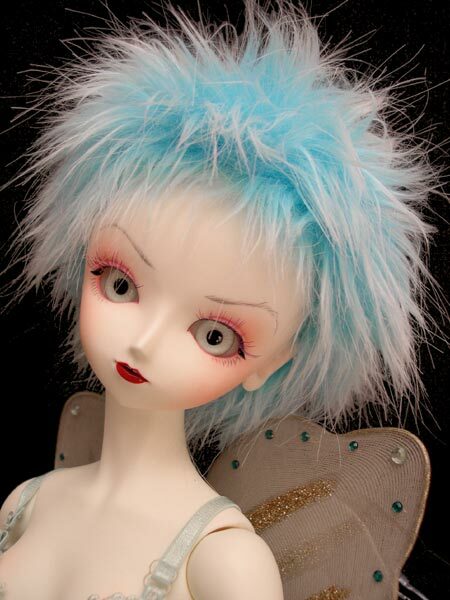 In which I bought this lovely and ridiculous icey bloo fluffy wig. I LOVE IT. Eee, that wig suits Fifi very much! Her bra is cute, too. I love how you make the green bit of fur look like a floating bit of island. Previous Previous post: What I’m talkin’ ’bout.